Our 32 Tips posts give you great advice on some of the most expensive destinations in the world. Check out all our 32 Tips posts here. Sydney has more natural beauty than any other major city in the world - at least, any other that I've visited. The harbor provides miles of coastline and beaches. The Blue Mountains to the west offer hiking and small town exploring. And the city itself is a culture hound's heaven. As you can read in my post on How to Avoid the #1 Travel Budget Mistake, Sydney is an expensive city - on par with Paris! This makes a 32 Tips post a must. Here are my 32 budget Sydney tips - tips that will help you eat, sleep and explore this fabulous city on a tight budget. 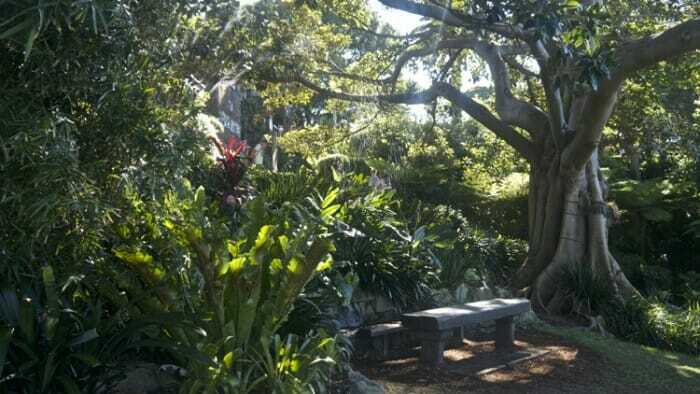 Wendy Whiteley's Secret Garden, North Sydney. Take public transit. To turn Sydney into budget Sydney start by taking public transit. From ferries crisscrossing the harbor to an extensive subway system to buses, public transit is, after walking, the cheapest way to get around. Use your Opal Card to save more. An Opal Card is the tap pass you can use to pay for public transit in Sydney. From Monday to Friday there's a $15.00 cap on how much you can spend in a day. On Sunday the cap is $2.50. Plus you can save 30% on your fares by traveling at off-peak times. Get the full details here. A harbor tour for $5.85. 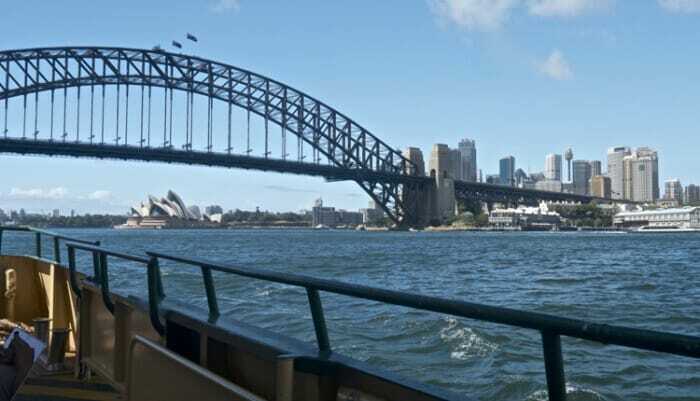 Tour Sydney Harbour by ferry. Your fare is calculated by where you tap on and where you tap off. But if you go a full circuit plus one stop the fare remains that for one stop. I learned this by mistakenly hopping on a ferry going in the wrong direction. As a result I got a tour of the inner harbor for the cost of one stop. The Harbour Bridge north to Kirribilli and Blues Point which includes the Secret Garden. 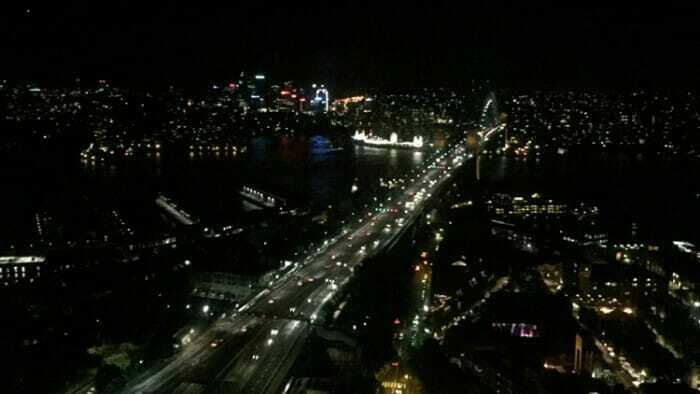 The Harbour Bridge south to the Sydney Opera House, The Royal Botanic Gardens and Art Gallery of NSW. The Harbour Bridge south to The Museum of Contemporary Art and The Rocks for shopping (markets Friday, Saturday and Sunday). 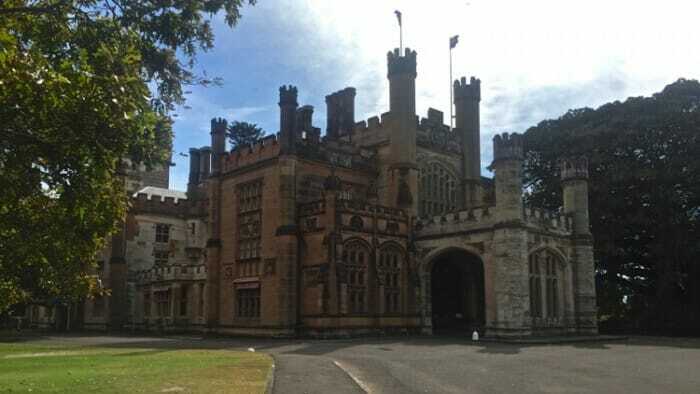 There are free tours of Government House, home of the Governor of New South Wales, in the Royal Botanic Gardens. Sydney Greeters. Whatever your interests, with luck, you’ll get a volunteer tour guide who shares them and will show you their beloved Sydney. I'm Free Tours of Sydney. Free tours but it’s important to tip – I think $5 is the minimum. Government House. Guided tours run every 30 minutes from 10:30 am to 3:00 pm most Fridays, Saturdays and Sundays. The tour takes 45 minutes and is free. Check the website for occasional closures. Identity such as a passport is required. The Olympic Pool in North Sydney is in an amazing location beside the Harbour Bridge and Luna Park, a classic fair grounds. Sydney City Pass. The Sydney City Pass will save you money on hop-on-hop-off buses and a variety of attractions. This link takes you to a full range of Sydney activities. Museums. Watch for free times for visiting the many museums in the city. The Museum of Contemporary Art is free for their permanent collection which I like because it focuses on local artists. The Maritime Museum. The permanent collection is free and there's a fee for special exhibitions. 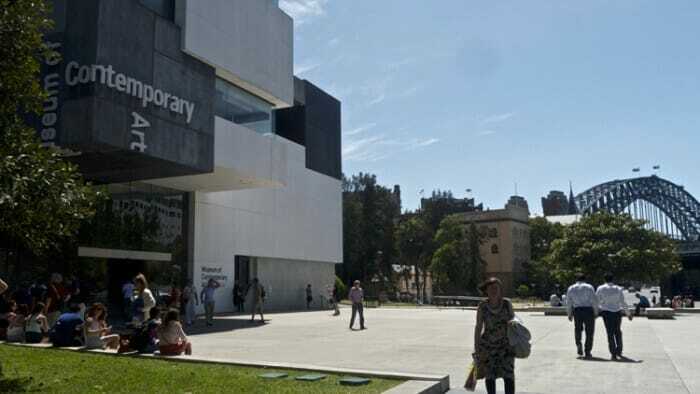 The Art Gallery of New South Wales. Almost everything is free and it's right near the Botanical Gardens which are also free. The Queen Victoria Building. This isn't a museum but rather a stunning historical building turned into a high-end shopping mall. Go to level 3 to watch the clock chime on the hour. The Sydney Opera House. Tickets to the opera in Sydney start at just $44. A great price by Opera standards. But there is so much more that goes on at the Opera House from small lectures (starting at $8.50 a ticket) to comedians. It's really worth checking out their schedule while you're there. Hang out by the pool. The Olympic Pool in North Sydney is a spectacular facility in a spectacular setting. For $7 you can spend the day. There are views of the harbor and the Opera House. Top of the Shangri-la. Free to enter, buy a drink or not, and enjoy the view of Sydney Harbour. Top of the Old Clare Hotel. When you're in Chippendale, maybe grabbing a meal at Spice Alley, go to the pool/bar at the top of the Old Clare Hotel for a cold drink. Take in a free event. There are events throughout the year and many of them are free. Here are just a few. Check out What’s On Sydney for events when you're there. Top of The Old Clare Hotel is a great spot for a cold drink on a hot afternoon. Save on tipping. Unless you're in a very high-end restaurant, tipping is not expected. The bill you receive will be the total price of your food plus a 10% tax. That's it. Save your tip for more food as the wait staff in restaurants in Australia are properly paid. BYO and save. Many restaurants in Sydney allow you to bring in your own wine. They'll likely charge you a corkage fee of $1.50 to $3.50 per head or per bottle. Pack a lunch from a specialty store or market. The beach is a big thing in Sydney as are parks and gardens as noted above. Pack a lunch from one of the many specialty food stores or markets and have a picnic in the fabulous outdoors. Enjoy a full dinner on a budget in Sydney. Here are a few recommendations by neighborhood. 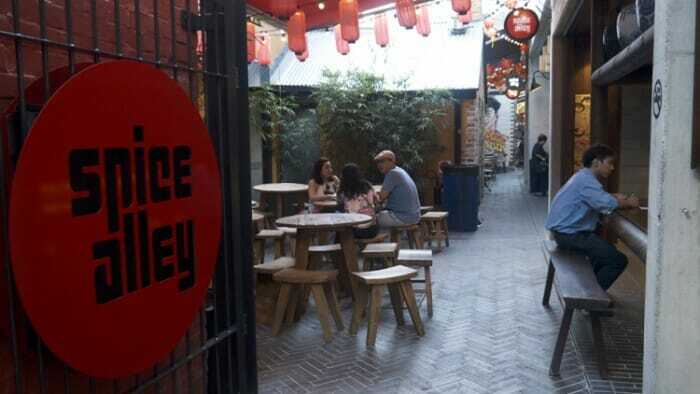 The Rocks - The Rocks Foodies Market is held each Friday from 10 a.m. to 4 p.m.
Chippendale - Spice Alley has a wide variety of Asian cuisine in a really fun space. Seafood is a must in Sydney. Go to the Sydney Fish Market see the mongers selling their wares and enjoy a fabulous selection of fresh, very fresh, sushi and other delectables for lunch. Time Out's recommendations for cheap eats. Check out Time Out magazine's current list for cheap eats in Sydney here. The Opera Bar at the Sydney Opera House. 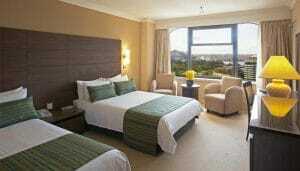 Here's a link to the Sydney budget accommodation page on Booking.com. 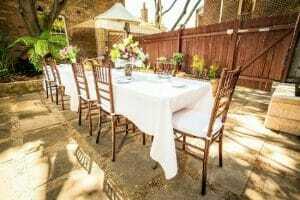 It’s located in the historic Rocks district in Sydney, just below the Harbour Bridge and about an 8-minute walk to the Sydney Opera House, Circular Quay, and central business district. Lots of local pubs nearby. Wonderful blueberry pancakes for breakfast and lots of great conversation with other guests. And the owner’s dog, Mate, was at breakfast every morning, while I was there! The Sydney Harbour in the Rocks YHA Hostel has a great location in a central area in the city with many things that you will want to see and do nearby. The hostel’s rooftop and BBQ area feature a stunning view of the city, the harbour and the iconic Opera House. 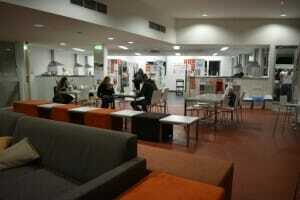 The hostel is only a few years old and is quite modern inside. There is a large kitchen for guests with lots of storage space for food. Each bed has its own light and power plug and each bed has its own large-sized locker with a shelf for smaller items. And inside each locker there is also another power plug so you can charge your devices while they are securely locked away. For it's location in the Sydney central business district you really can't beat the price. 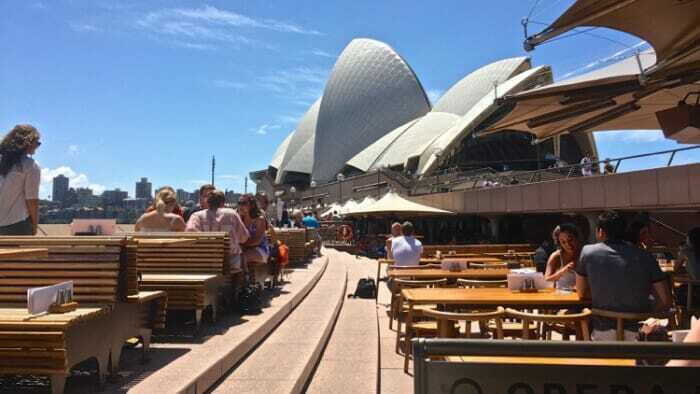 You can walk to many of the major Sydney attractions from this hotel, and if you can't, several bus and train stations are within a 5-10 minute walk as well. It's clean, the staff is friendly, it has great restaurants (although a bit pricey at times), and if you want to pay a bit extra for a harbour view room, the view is AMAZING! !